Let’s start with what everyone wants to know: If you put rentable public kennels around a city, will dogs poop in them? It’s the number one question fielded by the Brooklyn-based startup DogSpot which is pioneering this very concept. Made of aluminum with traditional slanted roofs, these for-pay dog houses are designed to safely accommodate your pet for short periods of time. Since they were unveiled around three years ago, these smartdog houses have popped up outside of bars, restaurants, and stores all over the U.S., particularly in tech-friendly downtown areas. The brainchild of seasoned nonprofit starter Chelsea Brownridge, DogSpot (formerly known as Dog Parker) was founded in 2015. Brownridge, whose previous enterprise was a nonprofit in partnership with The Huffington Post, wanted to take her terrier mix rescue dog Winston along while she ran errands in Brooklyn, but she was reluctant to tie him up outside. So she devised a solution that she hopes can make cities more dog-friendly: individual dog houses that you can rent for up to 90 minutes at a time using an app or a membership card. 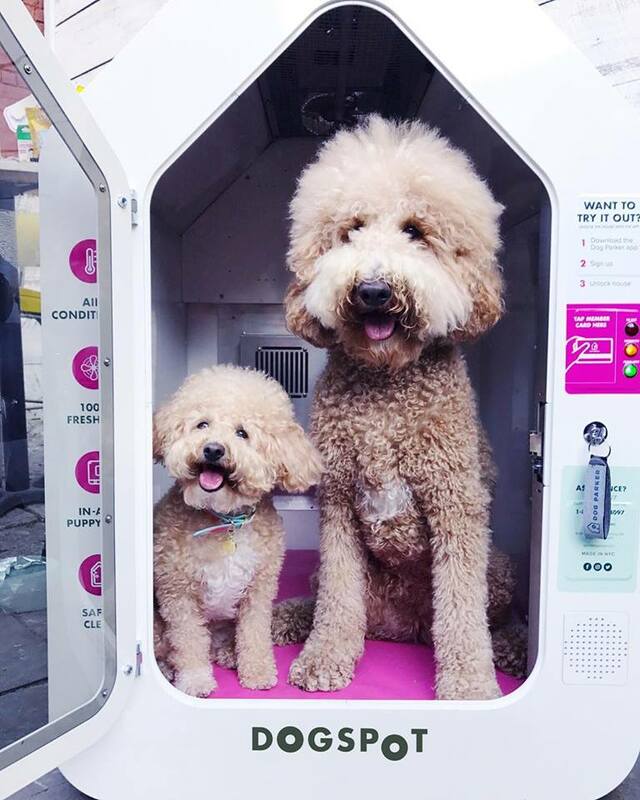 Designed to accommodate canines that weigh up to 100-pounds (although two small dogs can share one if they are used to spending time together), the houses have hospital-grade UVC lighting to sanitize the space in between uses, an in-app puppy camera, as well as air-conditioning and heating to keep your pooch comfortable depending on the season. The dog houses have proven popular with soft-hearted business owners who lament not being able to allow pets into their establishments. The structures are good ways to work around the law and a number of shops have reported upticks in sales and clientele since installing them. Dog owners are equally smitten with the rentable kennels. Given that 95-percent of pet parents see their fur children as members of the family, most are delighted to be able to take them out and about instead of being confronted with that sad doggy face every time they leave the house. “Being able to spend more time with our dog Harper is the best part,” DogSpot customer Kevin Dopp said in a press release. 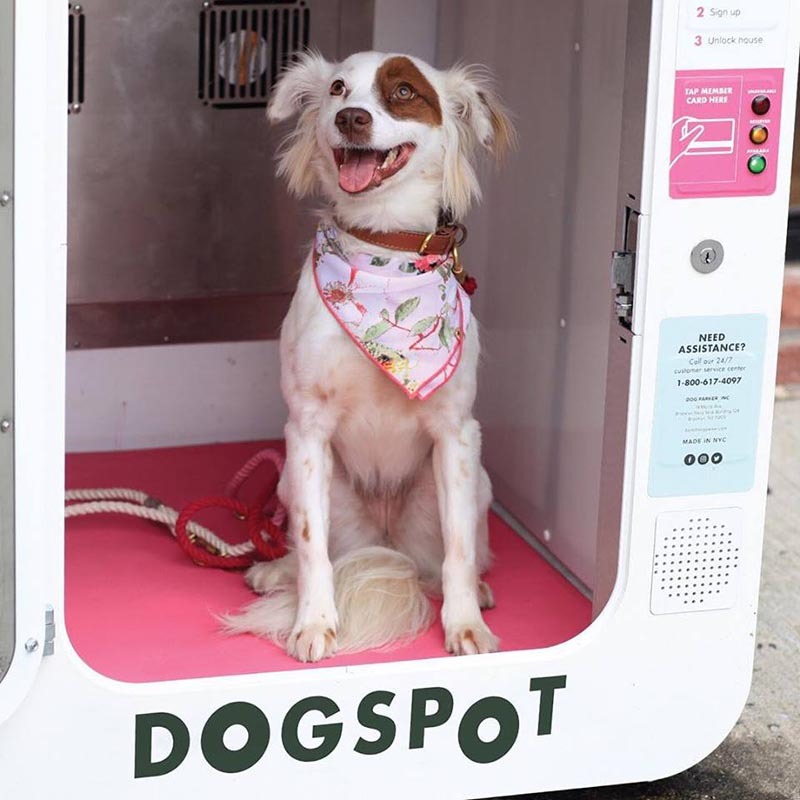 Following a pilot in New York, DogSpot has been rolled out to other cities in Texas, Missouri, Ohio, Minnesota, New Mexico, Michigan, Connecticut, West Virginia, and Nebraska, with more on the way. For the last few months, the company has paused its expansion to put the finishing touches on its new house model (which will be bigger and have a more house-like design). 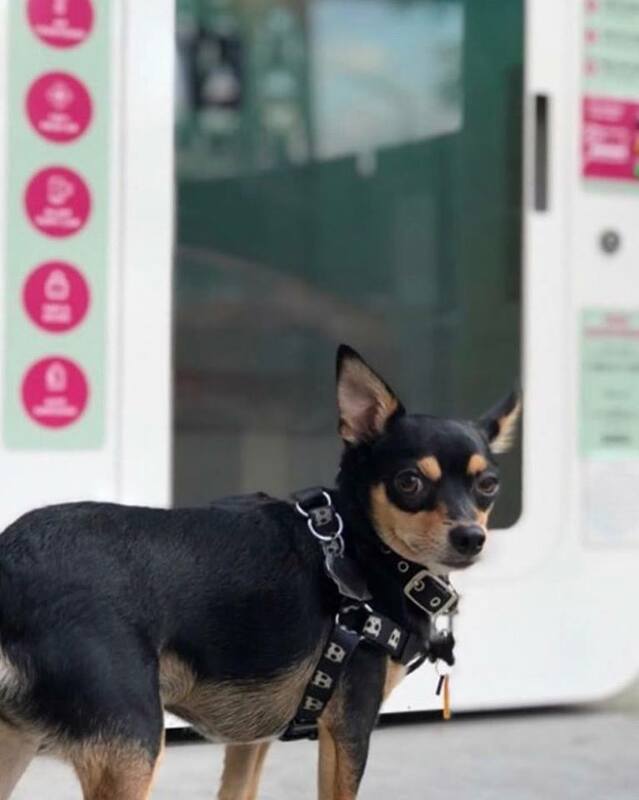 But soon dog owners in cities across the country, including Los Angeles, Sacramento, Las Vegas, Washington, D.C., and Seattle, will be among those able to pop into a store or meet a friend for coffee, while stashing their pup in one of DogSpot 2.0’s smart spaces. But back to the important stuff: What does happen when a dog poops in one of the structures? Nothing. According to Rebecca Eyre, DogSpot’s director of communications, no pooch has yet to answer nature’s call in one of their kennels. Of course, sometimes nature calls and you have no choice but to answer it. Fortunately, when, and if, that day ever comes, DogSpot has a protocol already in place. Here’s hoping DogSpot is able to continue its no-poop streak for a while longer.